Expansion for Dark Moon - Base game required. In Dark Moon: Shadow Corporation, the nefarious Noguchi Masaki Mining Corporation has learned of the infection on Titan, and will stop at nothing to acquire a sample - the profit potential for the bioweapons division is immense! Noguchi Masaki has sent an evacuation ship to the surface hoping that an infected worker will board it. The Corporation may be threatening the miners or their loved ones, forcing them to sabotage events. They may have embedded one of their own fanatically loyal underlings at the base, ordering them to acquire a sample at all costs. With The Corporation lurking in every shadow and tainting every decision, it will be even more difficult to answer the question, "Who can I trust?". 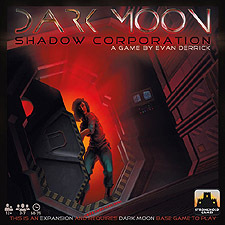 Dark Moon: Shadow Corporation includes new characters, new events, new endgame conditions, and two optional modules that can be added to escalate the paranoia and mistrust even further.